With warmer weather just around the corner, this is the ideal time to consider erecting an outdoor racking system for additional storage. For seasonal businesses in particular, outdoor racking is an inexpensive way to store products, but it’s also a great option for commercial/industrial organizations that have available land and don’t want to undertake an expensive warehouse expansion. Anchor the shelving appropriately. Vertical shelving uprights need to be anchored into the ground, and a concrete substrate is your best option. Avoid an asphalt base because its heat retention can impact structural integrity, and loose gravel won’t provide the needed stability for the unit. At a minimum you should pour concrete footings to anchor vertical stanchions. We recommend using at least two half-inch wedge anchors for each upright stanchion. Defend against rust. As with any metal that comes into contact with moisture, rust is a potential issue with outdoor shelving. However, there are ways to mitigate the onset of rust. Having the shelving steel hot dipped galvanized is the best option and will last for 50-plus years before the integrity of the steel comes into question. Power coated steel is another good option, but not guaranteed to last as long as the hot dipped galvanized process. Protect the structure. If you want to store products or inventory outside but protect it as much as possible, enclose your shelving on three sides with corrugated metal decking. Add a sloped roof to divert water and snow. 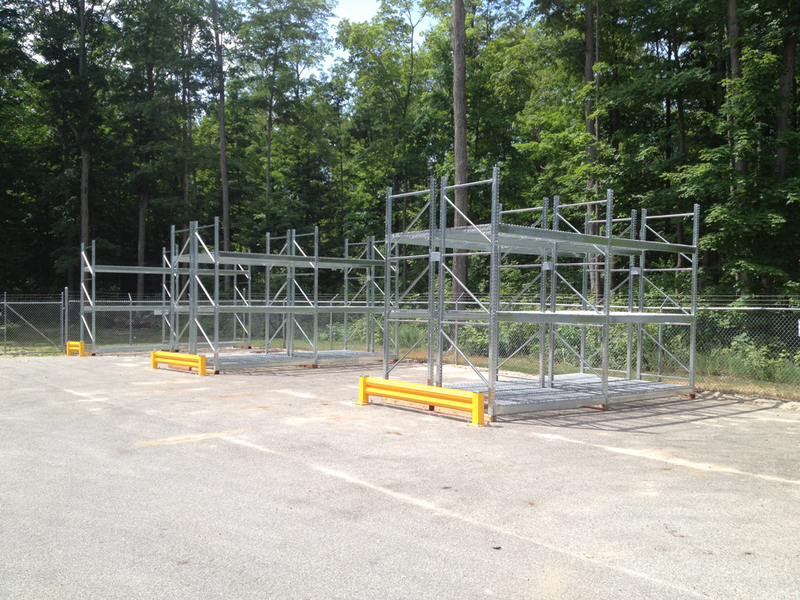 Take a look at our team installing outdoor galvanized racking for DTE Energy. With a skilled staff and strong, well-made materials that can handle the weather, our project will withstand the test of time.